Alan Bennett's renowned play The History Boys went on to make famous many of its original cast including James Corden, Dominic Cooper and Russell Tovey when it first opened for the National Theatre in 2004. More than a decade on and it's still sizzling with the playwright's acerbic wit and cynicism of an education system driven by targets and school governors. I caught the show at New Alexandra Theatre in Birmingham during its latest UK Tour that continues across the country to July 2015. 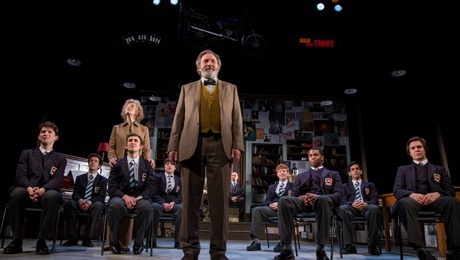 Set in the 1980s, the play follows a class of "history boys" at a grammar school in Sheffield, who are preparing for the Oxford and Cambridge entrance exams. While their fun, eccentric teacher Hector allows them to find themselves and learn about life through poetry, singing and play acting behind a locked door, his laissez-faire style in general studies sessions becomes more and more at odds with lessons by the new young, Oxford graduate Irwin. Irwin has been brought in by the headmaster to boost the boys' chances of getting into Oxford or Cambridge as he has inside knowledge and a ruthless method of teaching the class what dons want to see. Playwright Bennett, who is an Oxford graduate himself, gives a satirical observation of the Oxbridge system and manages to question school values when it comes to different styles of learning through some great one-liners. Hector is played with suitable flamboyance by Richard Hope as a misguided teacher, in some respects that become more apparent as the show goes on, but who, at heart, wants his boys to become better people by fighting the system and gaining knowledge for knowledge's sake. When going through a practice run of an Oxbridge interview, he rails against Irwin telling the pupils what to say, asking 'why can't they just be themselves?'. Why indeed. Weaved into the plot is also a sexual undercurrent of homosexuality and power plays even between pupils and staff that sometimes create an uncomfortable atmosphere. Among a strong cast, Christopher Ettridge is wonderfully sneering as the headmaster and Susan Twist also shines as a disillusioned female history teacher Mrs Lintott. Alan Bennett's play was voted the nation's favourite. 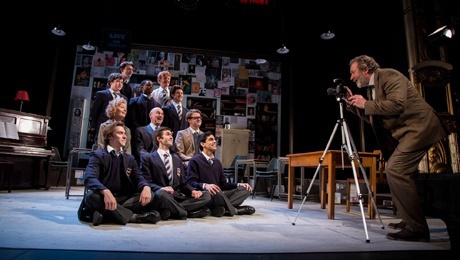 The History Boys won more than 30 major awards including the Tony Award and Olivier Awards for Best Play and was also nominated as the nation's favourite play in a recent national survey. I wouldn't say this is my favourite British play but it's an absorbing, witty piece of theatre worth seeing. The show is 2hrs 20mins including an interval and has a recommended age of 14 . Tickets cost from £11.90 to £35.40 and are available from the ATG Theatre website or through the History Boys Tour website.